On any Predefined Report, it may be necessary to change the roster of students for a particular assessment, or change the assessment for which you wish to review results. This document will explain the process for changing the roster and the assessment by using the Test Results Report as an example. In the Top Menu Bar, click the grid icon to open the navigation grid menu, and select Reports. Under the Predefined Reports tab, click on the name Test Results, or the view icon (eye) to the right. Or, from the Launchpad, click on the REPORTS Flip Card. On the reverse side, select Predefined Reports, then select Test Results. Once the Test Results Report is populated, the Roster and Assessment name will be listed underneath the report title. If the roster is not the one for which you want to view results, click on the Change Roster down arrow to right of the Roster year to select a different school year. From the roster search menu, select the appropriate year and roster. The SIS Current roster includes all students currently assigned to the selected roster. The SIS YTD (Year to Date) roster includes all current students and those who have previously been on the selected roster. Click Apply to view the results. Click the Change Roster up arrow (orange) to close the roster search menu. 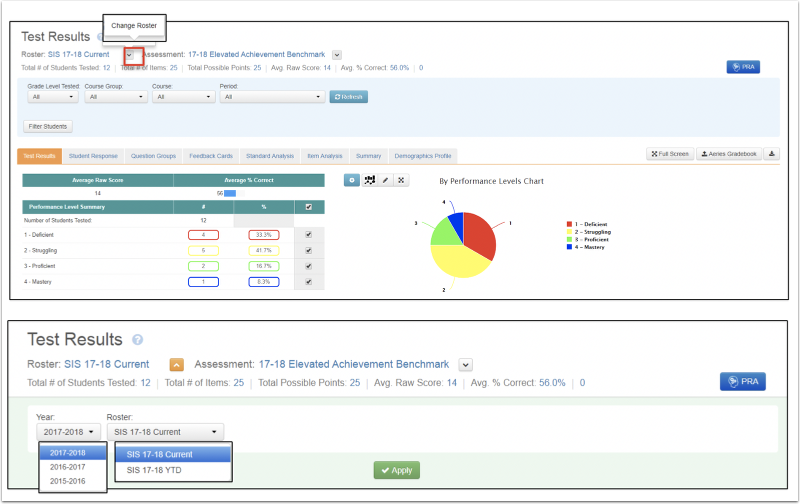 If the assessment shown is not the one for which you want to view results, click on the Change Assessment down arrow to the right of the Assessment name. From the assessment search filters, select the appropriate Year, Collection (optional), Subject, Tags (optional), and Assessment. Click the Change Assessment up arrow to close the assessment search menu.